As 2017 is winding down and coming to an end, that means tax season will be upon us before we know it. For many Americans and business owners alike, 2017 introduced financial obligations that will drastically affect how they file taxes. Although we live in a society that thrives on self-sufficiency—filing personal and business taxes should be left up to the tax professionals at Joseph Falco Accounting Services. While some may argue that they’re saving money by filing their own taxes through an online tax service instead of seeking the help of a tax professional, but we question whether or not you are receiving the full potential of your tax return. 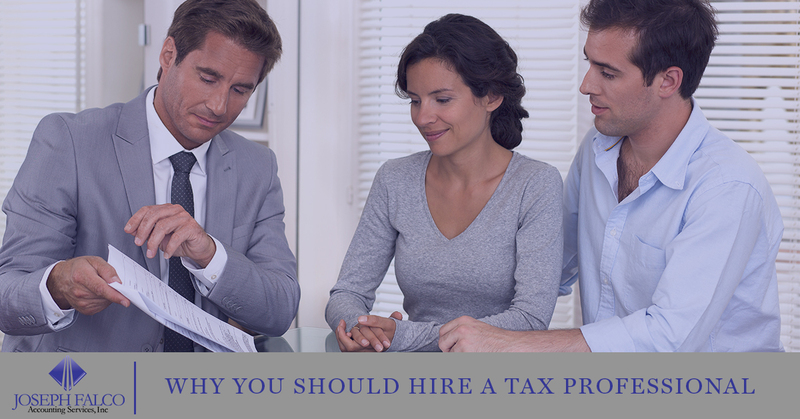 Before you hop online to file your own taxes for another year, read through these reasons of why you should hire a tax professional this year. Small business owners have a tremendous amount of expenses they need to keep track of each year, and often attempt taking on challenges like bookkeeping, accounting, and tax preparation themselves. The reason being is valid—to ultimately save money. But the risk of overlooking essential factors that can lead to potential tax disasters is too high. Generally speaking, the only people that can benefit by doing taxes themselves are individuals who live on a single income, zero dependents, and absolutely nothing else to claim (business expenses, property taxes, write-offs, etc.). Anyone else, that is not a tax professional by trade or have a knack for preparing taxes, would do themselves a serious favor by hiring Joseph Falco Accounting to handle their taxes. Who takes the time to read up, understand, and consider the year’s new tax laws before they sit down and file taxes online? Not many people. Anyone other than tax professional or Enrolled Agents (EA’s) likely won’t have the most up-to-date knowledge on this year’s changes in tax laws. To save yourself, and your business, risky errors on your tax returns, consult with one of our tax professionals and let Joseph Falco Accounting manage your taxes to ensure that you are in accordance with the IRS requirements and won’t risk a time-consuming audit. One of the most common questions we get from business owners is, “How can I improve my expenses for next year?”. That’s just one question among many others that our team of tax experts can provide a personalized answer to. Are web-based tax filing programs going to advise you on what is financially best for you and your business? Not likely. For individuals that are planning for the near future like buying a home, investing funds, or long-term goals like retirement—a tax professional will help. Our team of experts will sit down with you and evaluate your personal and business expenses and direct you in the direction you need to go, financially to prepare you for your future. We won’t disagree that filing your own taxes can and will save you money—in the short term. By choosing Joseph Falco Accounting Services to prepare your taxes, you will receive expert, professional, and personalized advice that will help you get the most out of your tax return. Contact Joseph Falco Accounting today to schedule a consultation at no charge to you. We are looking forward to helping you work towards your financial goals.